Do you wish to always have clean and sparkling windows in your house? I think I know your answer. It is YES right?. Because along with giving a fresh look to the house and enhancing the interiors, it gives us a better and clear view of the outside space around us. Window cleaning is a satisfying experience for the eyes. It gives a pleasing moment when you see the dirt flowing down while cleaning. Dirty windows give a sense of darkness and dullness. Even the sun’s rays find it difficult to reach the interiors of the house through the dirty windows. And if this is the case with the windows at your place, it is the time to clean it. I know that cleaning the windows is a task which you always want to avoid as long as possible because you think it is difficult. So you even end up spending money hiring professional cleaners for the purpose. But what if I tell you that I will help you to make the process easier and that too with better cleaning results. Yes, these cleaning tips and hacks will make your window cleaning process easier and less hating along with giving you shining windows. 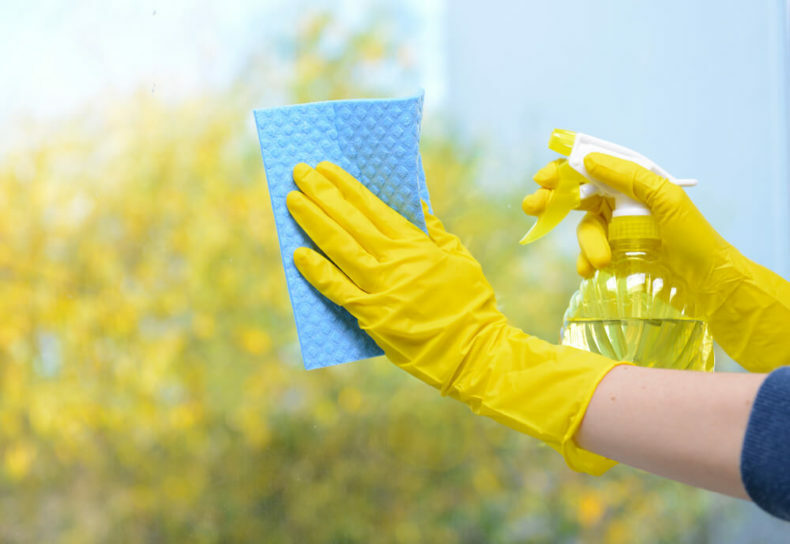 When the warmth of the sun is directly hitting the windows, the cleaning solution will dry up very fast on the windows and will leave a residue behind in the form of spots and streaks. 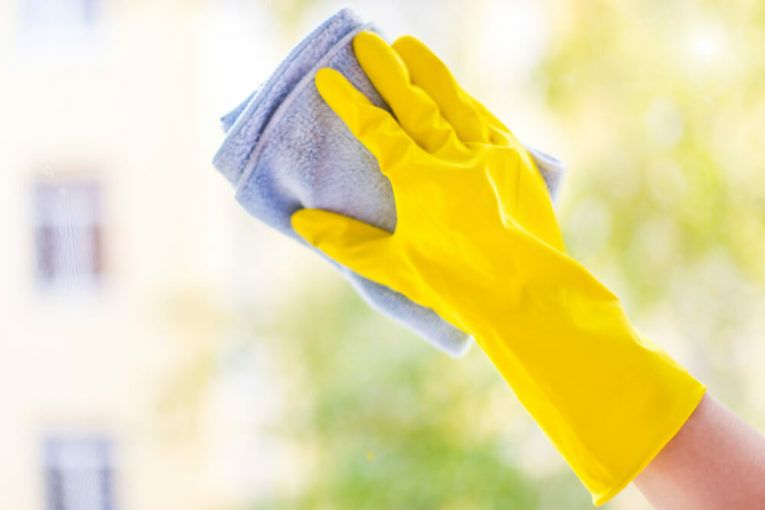 The proper time to clean is when the sun’s rays are not directly hitting the windows or on a cool day or even during the early morning or night hours. Not only the time to clean the windows should be proper, but also the tools for cleaning should be adequate. Before you start cleaning, you should know which cloth or tool you should use for a perfect clean. 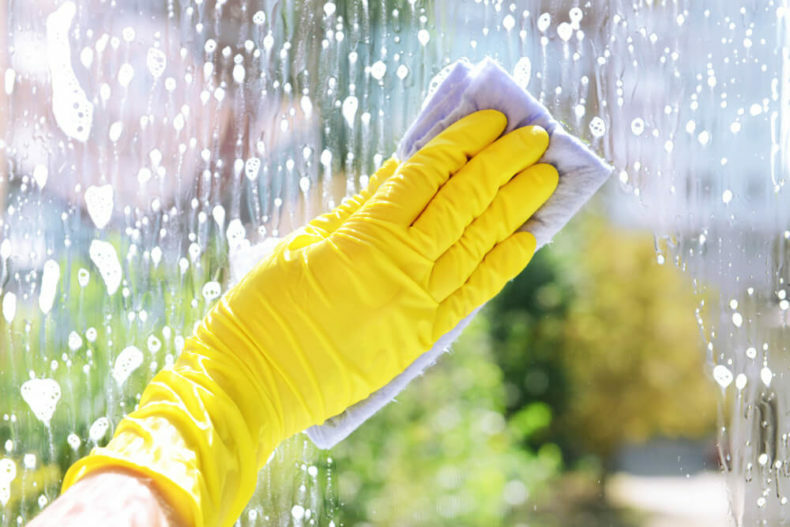 If you use any old cloth or towel to clean your windows, they will still be left with debris and lint. Use a microfiber cloth for a lint-free clean. Newspapers will also be a good choice for a proper window clean. And a spray bottle is must have to store the cleaning solution or water if windows are not too dirty. 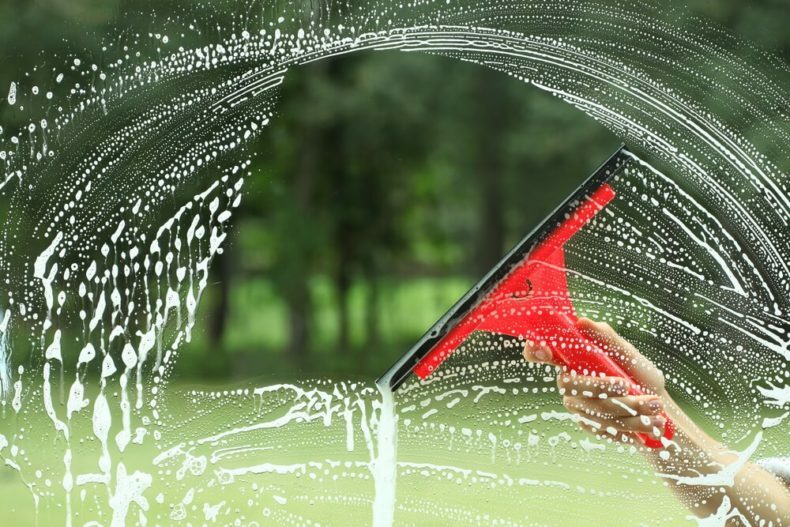 A microfiber cloth or newspaper along with the cleaning solution and some water is one of the best combinations for shining the windows. You can also use paper coffee filters if you are worried about catching the ink from newspapers on your finger. Another alternative to wiping the windows with a newspaper or cloth is using a squeegee to clean the windows. It also ensures a spotless and streak-free clean. Using hard bristle brushes and tough clothes to clean the windows can damage them. Once I used a hard bristled brush to clean my room’s window which resulted in some scratches on the window. After that day, I have just used a microfiber cloth or sometimes a newspaper to make the windows sparkling again. A distilled solution of white vinegar acts as a good cleaner. Make this cleaner by mixing vinegar and warm water in equal quantity. You can take a basic measurement such as 1 cup white vinegar and 1 cup of warm water and then mix it together. Use this solution to quickly clean the windows. If you want to use this solution for cleaning your kitchen windows, it is advisable to prewash the windows with soapy water. Or you can directly add the Dawn dishwashing liquid (around 5-6 drops) to the vinegar solution and use the resulting solution to clean the windows at once (I prefer this route). This is because kitchen windows are generally grimy. If they are not, then just use the distilled vinegar solution. After cleaning with this vinegar-soap solution, rinse and wipe the windows to clean the soapy layer properly. For this reason, don’t add much dishwashing liquid as the dish soap may build up a soapy film which will be comparatively more difficult to clean. Related: Stupid Ways to Clean using Vinegar you should know. Out of vinegar and lazy to get a new one from the shop? No need to worry. I have an alternative for you. Brew a strong cup of black tea and allow it to cool for about an hour. Dip a cloth in it or fill it in a spray bottle and let it do its magic on the windows. The tannic acid present in the tea is the main ingredient responsible for this magic. What more, you can also use Black tea for cleaning the bathroom mirrors too. Got a scratch on the window? Don’t worry. Here is an easy solution you should try out. Furbish that scratch (or scratches) using non-gel toothpaste. Personally, I haven’t tried it yet (my good luck: the windows are scratch free). I read it somewhere so I am not sure if it will work or not. You can try it out and I would be grateful if you would let me know whether it worked or not. I can understand that the remains of the sticker are difficult to clean as I have been through this problem. But WD-40 can make it an easy task which you can do by closed eyes. WD-40 is an awesome cleaner and can easily get that gunk off the window. Related: Awesome WD-40 hacks you might have never heard of. Trending: 12 Unique Home Cleaning Hacks That Will Save You Time and Money! While wiping off the cleaning solution and water from the windows, it is for them to run all the way down and sit on the edges. Clean that accumulated liquid with a microfiber cloth or a soft cloth. Microfiber cloth soaks up the water or the cleaning solution and does not leave any lint behind on the glass. Even a soft steel wool pad works well. Scan the windows at different angles and clean any leftover watermarks to get a perfect window. Window screens are full of dust, spider webs and all other kinds of dirt that we hate. 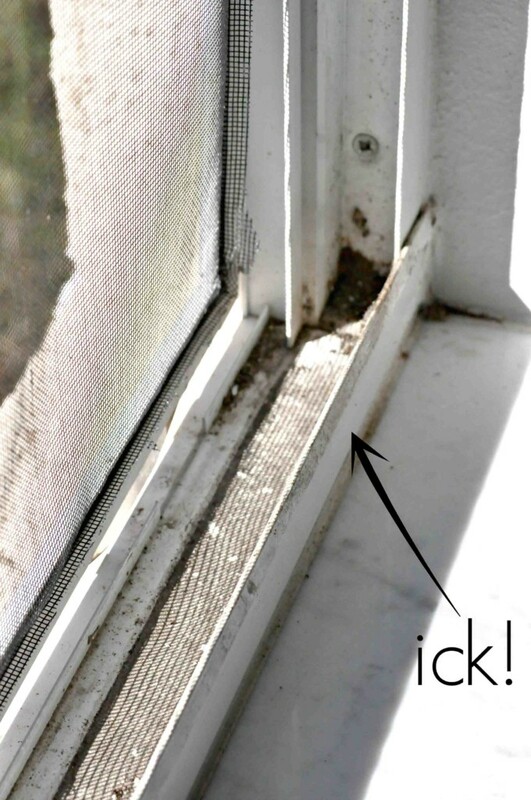 A lint roller can successfully clean the window screens. With time muck and gunk accumulate in the window tracks. It’s hard to get your hands in these narrow tracks. Baking soda and vinegar is the solution to clean such dirty tracks without any hard work. All you have to do is to sprinkle baking soda in these tracks and then pour some vinegar over it. Leave it for 5-10 minutes. Vinegar reacts with baking soda forming bubbles and this mixture loosens away all the gunk. Then, get in those window tracks using a sponge brush and wipe away the entire thing in the track. Even the dirtiest window track which has not been touched for years can be cleaned using baking soda and vinegar. So wonderful!! Even after using a vinegar cleaning solution, if there is still a stain left on the window(OMG! Then that stain is seriously tough) you don’t need to panic and start scrubbing it vigorously. It will just damage the window. I have an easy solution to this. Mix 4 cups of warm water, a ½ cup of vinegar, a ½ cup of alcohol, and 4 tsp of cornstarch in a vessel or spray bottle. Rub it on the spot, then rinse and wipe. The stain is gone! Cornstarch too is an amazing cleaner just like baking soda. It is not something which can just be used in the kitchen. Want to know more? Check out these 20 Brilliant Home Hacks Using Cornstarch. You can also use this mixture as a regular window cleaner just like the above-mentioned vinegar solution. This solution also works great for cleaning frosted glass. Chalkboard erasers work well for a quick cleanup of dust. Whenever I am not in the mood of washing the windows, I just clean the dust by using a chalkboard eraser. So whether the windows have caught up dust or long streaks, use a chalkboard eraser for a quick clean. 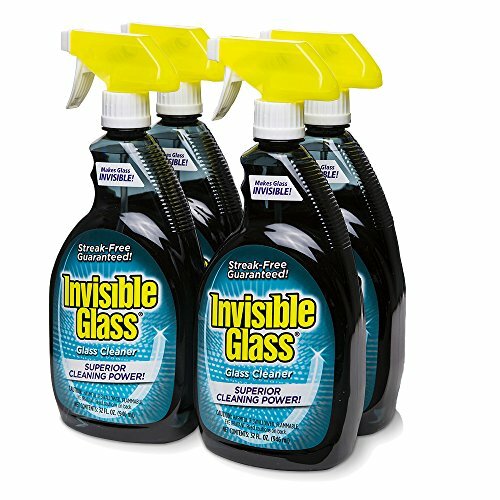 If you wish to get a readymade cleaner, then nothing beats Invisible Glass Cleaner. It’s so effective that it will keep your windows spotless for months. All you need to clean your windows are a microfiber cloth and this glass cleaner. Just spray the cleaner on a microfiber cloth and wipe clean the windows. The best thing is it contains no ammonia and if you’re not satisfied with its performance they offer a guaranteed refund. It also works for shining granite surfaces, outside of your microwave, refrigerator, dishwasher, coffee maker and so much more. Related: How to Clean a Coffee Maker? If you like the post share it on Pinterest! What’s your say on window cleaning? Which tool do you use? Now we hope that this post will be helpful for you in cleaning the windows successfully. But, if there is something which you would like to know more about or tell us about, feel free to comment in the section below.